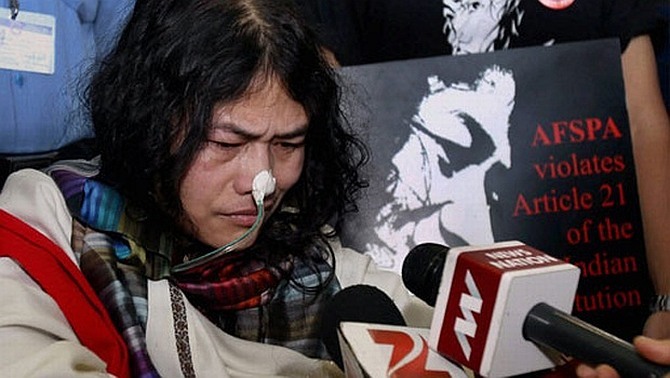 The sudden decision of civil rights activist Irom Sharmila to end her 16-year-old hunger strike against AFSPA next month has taken everyone by surprise including her associates and family members. Irom's elder brother Singhajit, who has been with her throughout her struggle said he never knew she was going to terminate her fast. "I haven't spoken to her in the last few days due to my bad health. I heard it from others about her decision," he told PTI. Sharmila's long-time associate Babloo Loitongbam, Director of NGO Human Rights Alert Manipur, said he too was taken by surprise but can understand the reason behind her decision. "If AFSPA has not been repealed in 15 years of her fast then it won't happen in another 30 years also," he said while admitting that he too was not kept informed about her decision. In 2000 when the activist embarked on her hunger strike, she also had taken a vow to neither enter her house nor meet her mother till the government repealed the Armed Forces (Special Powers) Act. Since then, she has met her mother Sakhi Devi only once when she was also admitted to the same hospital in 2009. Her brother recalled that during the early years of her fast he regularly tried to convince her to end it. "But she never listened to me. Finally I gave up and promised that I will be with her throughout her struggle. She used to say that she will break her fast only when they remove AFSPA. That was her promise," Singhajit said. Nobody is sure what prompted her to take the decision. Her associates say her British boyfriend may have played a crucial role in ensuring that she breaks her fast. "But it is also her frustration at the government for not listening to the demands of the people. So she is changing her path from activism to politics. Her goal remains the same -- revocation of AFSPA," another associate said. A team of her associates is planning to go and meet her at the government-run hospital, where she is forcibly nose-fed to keep her alive to discuss the future course of action. Sharmila's struggle has been at the heart of all protests against repel of AFSPA in the Manipur and the neighbouring North-eastern states.